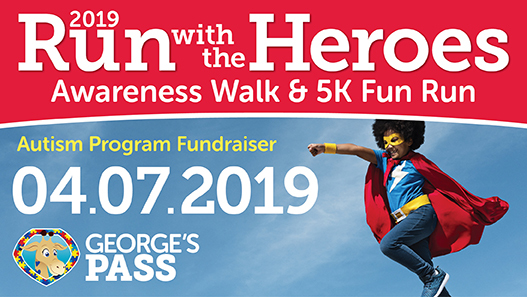 (Madera, California) – Valley Children’s will hold the fourth annual Run with the Heroes 5k Run and Awareness Walk on Sunday, April 7. As an added treat for participants, members of the Fresno State Bulldog Blitz will skydive and land right on the Hospital grounds at approximately 8:45 a.m. The team is a proud sponsor of this year’s event. More than 1,500 participants are signed up to run or walk the course, which will start on the east side of Valley Children’s Hospital and wind through the campus. The event will also feature a resource fair, autism-friendly activities, music, food and booths. Each child will receive a free superhero cape. Proceeds from the event will benefit George’s Pass, the only program of its kind in Central California that expanded throughout our network three years ago. The Perioperative team at Valley Children’s launched George’s Pass in 2014. The program is designed to improve care and ease the hospital experience for children with autism spectrum disorder (ASD). The program’s founder is day surgery nurse Shelly Reyes, mom of a 14-year-old boy diagnosed with ASD who’s also a patient. George’s Pass is also available to families of children with sensory issues (for instance, light or sound sensitivity) and special needs. According to the Centers for Disease Control and Prevention, ASD affects about one in every 68 children, making it the fastest-growing developmental disability nationwide. In the 1970s, autism affected about one in every 10,000 children. ASD is about five times more common among boys than girls. April is Autism Awareness Month.